If you need a cheap gaming TV for your PC, or you're looking to upgrade to a better 4K display, these are the best deals this week. As a proud PC player, why would you need cheap gaming TV deals anyway? Surely it's all about monitors, right? You simply can't replicate that response rate or refresh rate on a gaming 4K TV, no matter how much you spend. Well, yes, that's true but 4K TVs have come on leaps and bounds in the past few years, especially for PC functionality, so they're becoming an increasingly good option if you're looking for a larger screen and you want to pay much less for 4K gaming. Yes, you sacrifice that 1ms response rate but... you potentially get a bigger screen for a fraction of the price of one of the best gaming monitors. While Black Friday is undoubtedly the time to bag a cheap gaming TV for the year, you can still find great offers each week, if you know what to look for. 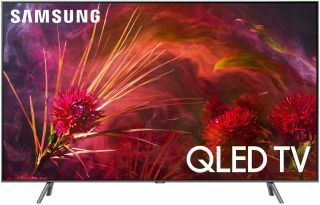 March is actually a great time to buy a new TV if you're looking for a Samsung, as the company has started to roll out its new QLED range, meaning last year's models (which are amazing panels) are going VERY cheap. Below are the cheapest deals on gaming TVs right now, with 'best savings' up top, and actual sub-$500 4K TVs beneath that. This is one of our best 4K TV for gaming picks. Getting this high-quality LED TV is well worth the investment, as it's cheaper than the Q9 but comparable for performance. Buy at Walmart. If you're going OLED instead of QLED, for deeper blacks, this is the TV you need. It's pricey, but the picture on this LG set is unrivalled. It's also super thin, and will look incredible in your living room. Buy at Walmart.